In just a decade, WiFi signal has become almost as essential as food, water, and shelter. A weak signal can be a modern day nightmare. Poor loading times and lost connections can test your patience while browsing the internet. This guide will help you understand why your WiFi signal can become weak and how to improve it on the cheap. I just moved and recently got cable. The Internet installer laughed and mocked my wireless B router. I had no idea I was using caveman technology. Apparently WiFi speeds are much slower on wireless A, B, and G routers. Wireless N is all the rage when you want the fastest speeds possible. You will need both an N router and an N card in your computer for maximum speed. Here’s Amazon’s best selling N router. While not as annoyingly frequent as app updates, router manufactures sometimes issue stability resolutions via driver updates. Go to the manufacturer’s website to download all new maintenance updates and changes. Routers can be disgusting looking things and your first instinct is to hide it behind your television or in a box. Resist that urge as a wide open router, clear of obstructions and with antennas pointed upwards, will perform better. Make sure the router is relatively close to where you’ll be using the WiFi. If your WiFi is having trouble reaching all ends of your house or large office, consider buying a range extender. A basic $25 extender should do the trick. This probably won’t make your WiFi any faster, but at least you’ll have Internet access in the basement and attic. You can also create a DIY extender, but I am certainly no expert on that. Wireless routers broadcast on numerous different channels, similar to radio stations. It can cause buildup and static if a lot of people are on the same channel. Newest routers feature automatic channel selection. If you have an older model, test and try another channel to see if you experience less interference. Use the free Wifi Analyzer Android app to pick the best channel for your router. The app works great by scanning immediate channels and helping you find a less crowded channel. Move the router around the house to maybe find an even better channel. For iPhone users, check out the $4 WiFi Explorer app to help find the right channel. 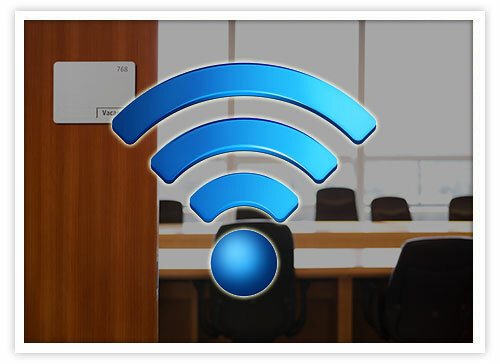 Quickly identify channel conflicts, signal overlapping or configuration problems that may be affecting the connectivity and performance of your home or office wireless network. Get an insight into network details like name (SSID), MAC address (BSSID), device manufacturer, signal strength (RSSI), noise, channel, band, security configuration, supported data rates and much more. Even if you have a fast connection, too many electronics can often overwhelm your WiFi. Using two routers can be very beneficial. Take advantage of the free (or cheap) router your cable provider gave you and use it as an access point. This is useful for a home entertainment system or a game console that can be constantly plugged in via Ethernet cables, leaving the WiFi for your smart phones and laptops. If you want to go a more expensive route, this OnHub wireless router promises to provide wi-fi to houses and businesses as large as 3,000 square feet. Your freeloading neighbors will now have to search elsewhere. WPA encryption is much harder to hack than WEP, so go with WPA for your password. You can check if someone other than you is using your WiFi. Make sure your network, gaming console, and everything else using the Internet is turned off. Look to see if the wireless light is still blinking. If so, you may have a leech (or worse, a potential hacker) to deal with. Use a program like MoocherHunter, which is used by police in some countries, to find real-time users of your wireless network. If you have followed most of these steps, and still don’t see an improvement, check out what kind of speeds you are getting at Speedtest.net. If the speed is significantly lower than what you are paying for, discuss this matter with your cable provider. Sometimes cable providers throttle down your Internet performance so they can hit you with a bandwidth usage fee. Research your provider and consider switching to a company who doesn’t limit your Internet speeds. There’s plenty of more tricks and tips for faster WiFi speeds, like using a beer can. Do you have any WiFi hacks to share with the class? Jared S. is HostDime’s Content and SEO Strategist. Use my code HDJAREDS for 15% off the 1st month of any server. An easy way to increase 2G/3G/wifi network signal or internet speed. Tutorial is.. Very useful information for home users. Check out Cucumber Tony. They’re great if you looking for a better wifi for your business. They have some informative blogs as well on their website. Wifi and Broadband Hope you all find it useful. The 150Mbps Wi-Fi N Household Router provides the greatest degree of safety measures using 6x the particular speed as well as 3x the particular protection of wifi g products. Quickly deploy the particular router as well as work with it using TRENDnet wifi N adapters to take delivery of the total advantages of wifi N speed as well as protection. This is really wonderful trick i used this techniques now for my wifi, But one thing we used for every type of wifi server or router and booster, Tell me if this possible. i love your every post. but sometime you describe very well. my wifi have these of problem . “Go to the manufactures website…” The correct word is “manufacturer’s,” not “manufactures.” Otherwise, good article. Thank you for the list, Now please solve my query. i need wifi network on my 3rd floor room. i have router at ground floor, in that case should i use two wifi extender or is there any other cheap trick available. thanks again. I think you would be fine with just one wi-fi extender, or a second router. We have a detached apartment about 20-25yards from our home. Currently, the WiFi signal doesn’t reach this building. I will need WiFi to use this space as an office. What would you recommend for extending the signal through our backyard to this structure? What’s the beer can trick? I’ve never heard of it before. Just FYI, I am using a Samsung Luna smartphone and none of these things worked for me but it’s good information. Cut top and bottom off a can then cut open the remaining tube. Get creative with hot glue and popsicle stick open up the can to make a C shape and mount behind your router antenna pointing the signal to where you need it most. Essentially instead of throwing your signal in every direction you’re reflecting wanted signal in a useful direction.